Backpackers HQ, now with SUPER-FAST UNLIMITED WiFi! We were voted the #1 Hostel in Australia by Hostelworld guests for the month of August 2012. PLEASE NOTE: We are an international youth hostel. We can only accept guests with a valid international passport and do not accept guests over the age of 35 in dorm rooms. Unfortunately we have no facilities for guests under the age of 18 years. •When booking on line, please be aware you are booking a bed not a room. •Please also be aware that multiple guests booking on the one booking may not be staying in the same room. 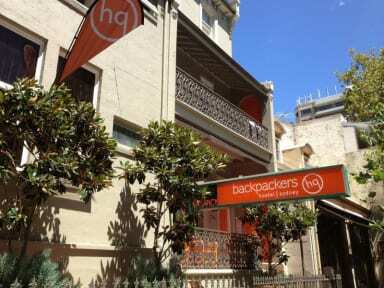 Backpackers HQ is newly renovated and positioned right in the heart of Sydney's vibrant King's Cross. We're set on tree-lined, cosmopolitan Victoria Street among the cafes and restaurants. We have great views of the CBD and are an easy walk to the city centre. Our hostel feels like a home away from home. It's clean, secure, comfortable and stylish. Our amazing courtyard, relaxing garden areas and fully equipped stainless steel kitchen are the best in the Cross. Our free SUPER FAST UNLIMITED WiFi will keep you in touch with your family and friends back home, while our amazing breakfast will keep you full all day. The free breakfast includes the choice of cereals with milk, toast and a large selection of spreads as well as fresh seasonal fruit and teas and coffee served in our atrium courtyard. Our great location, atmosphere and level of comfort guarantee you a fun, exciting and adventure-filled time in Sydney. 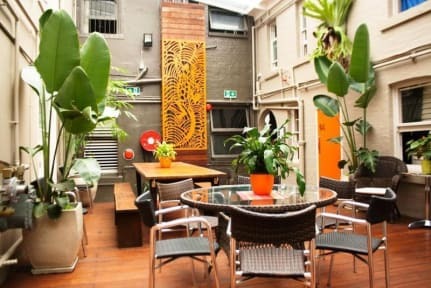 So whether you're here to work or play, we offer a quiet, friendly hostel with exciting Sydney at your doorstep. Our freebies include free use of our exciting new giant chess set, free use of the personal security lockers in each room (large enough for your backpack), free linen and blanket hire. You can relax any time in our huge, 24hr TV lounge/library area, complete with cable TV. Pretty good overall, but the karaoke people were really loud until maybe 10pm. Too warm and stuffy in the room, but compared to some other hostels in Sydney, this is pretty good! The best hostel I lived in Kings Cross. Except one thing - tons of cockroaches. It was the whole army of this insects in the room and in the common area, espeially in the evening. With the rest everything is prety nice, the dorms, the kitchen, the stuff is really nice. I lived in a big dorm and I was the only one traveller - other people came to Sydney for work, but I have to say, that thay behave much better, then young boys and girls who come to the city for parties. Not the greatest showers, even on hostel standards. The wifi was really good though. I paid $20 for a bed in a 12 people room. You don’t wait big services, but staff is not friendly and my room had one small window to the lounge (veeery noise). Breakfast is OK. I didn’t like the vibe of that hostel.